MY THANK YOU'S ARE WAY BEHIND. COUPLE THAT WITH A SENIOR MEMORY ( I.E. WORSE THAN IT WAS WHEN IT WAS ONLY BAD..) I CAN'T REMEMBER WHO TO THANK FOR WHAT..
LAST NIGHT ONE OF THE REGUAR CP's NOTICED THAT THE BUNCH OF US COULD USE A GOOD MEAL AND SENT $200 -- WE COULDN'T GO ANYWHERE BECAUSE OF THE PUPS.....SO ONE OF US WENT TO A VERY SPECIAL TAKE OUT RESTAURANT ( NOT THE CHINESE FOOD ONE) AND HAD A VERY NICE LAP DINNER. LAP DINNER BECAUSE WE WERE LUCKY TO COME UP WITH ENOUGH CHAIRS... MAKE THAT "SITTING DEVICES" AS WE WATCHED THE NEW PUPS. ON A REQLLY BUSY DAY COULD BE WE HAVE STANDING DINNERS..
ONE OF THE CRITICAL ONES TO THIS COMMUNITY ARE THE PEOPLE WHO SEND ME $1 FOR THE FUN FUND JUG -- BECAUSE THAT IS ALL THEY CAN AFFORD- BUT THEY KEEP AFTER THE PEOPLE WHO CAN AFFORD $10 OR MORE TO FILL THE CHICKEN BOARD-- THAT CHICKEN BOARD IS WHAT IS HOLDING THIS CRAZY OUTFIT TOGETHER. AND IT IS SOLD OUT AGAIN -- YOU HAVE NO IDEA-- MY POINT IS MILLIONAIRES ARE LOVELY- BUT WE DON'T SEEM TO KNOW ENOUGH OF THEM... SO THANK THE GODS FOR LOTSA REGULAR PEOPLE WHO ARE ABLE TO BUY A BRICK !! BASICALLY FOOD --- UTILITIES--- AND SOME VET BILLS. .2 MACHINES RUNNING NEARLY ALL DAY... BUT CLEAN IS BEAUTIFUL-- AND IS RIGHT BEHIND WARM FOR COMFORT. OR I SHOJULD SAY COOL... THIS IS SUMMER... AND BUD JUST RESERECTED AN OLD AIRCONDITIONER FOR THE NUTT HOUSE. THE MISTERS WORK WELL INTHE BARN WHERE WE HAVE ACCESS TO WATER.. THE OTHER ODD BILL IS THAT BIG DUMPSTER RIGHT BEHIND THE PUPPY HILL CAMERA THAT IS $346 PER DUMP. SOMEBODY IS COMEING HERE TODAY.- I AM SURE YOU ALL REALIZED THAT NYWAY... BUT THIS PERSON IS COMING FROM SOMEWHERE 2 DAYS DRIVE AWAY- AND THAT IS ALL I REMEMBER- THE TRAINING ROOM HAS BEEN ACTIVATED- BECAUSE WITH THERESA OFF ON VACATION WE AREN'T TOO SURE WHO IS BOOKED FOR THE GUEST HOUSE. IF WE GET INTO TOO MUCH TROUBLE, THERE IS ALAYS THE HOTEL DOWN THE ROAD WHO DOES DONATES A FEW ROOMS EVERY ONCE IN A WHILE.. THE NEW TIPI IS NOT UP YET-- THAT IS NEXT. THAT HOTEL IS NOT TO BE USED " BECAUSE IT WOULD BE EASIER"
BECAUSE OUR GUEST CABIN IS REALLY A SURVIVAL TEST. YOU HAVE TO BE ABLE TO SURVIVE THERE TO BE ELIGABLE FOR A DOG. NOT AN UNREASONABLE TEST. THERE SHOUJDL BE A BUNCH OF PEOPLE HERE TODAY SO I WILL GO OUT-- MAYBE JUST TO STAND IN THE RAIN-- BUT OUT IS A GOOD THING. I LIKE RAIN- AND I LINE WORKING IN THE RAIN-- AND IF I AM ALL ALONE I MIGHT EVEN BE SINGING INTHE RAIN. SPEAKING OF PRIVACY- LAST NIGHT I RUSHED IN TO HELP JADE AT 1AM AND DID NOT REALIZE THE CAMERA HAD BEEN MOVED TO EXACTLY BEHIND ME--- THANKFULLY THE PERSON WHO CAPTURES SCREEN SHOTS OF ME IN STRANGE SITUATIONS WAS APPARENTLY ASLEEP. MAYBE IF I HAVE ENOUGH TIME/ENERGY... I CAN DIG ANOTHER POST HOLE WITH MY SPOON... WHILE SINGING IN THE RAIN... IT COULD PROBABLY BE SEEN FROM THE PUPPY HILL CAMERA DOWN BY THE T TENT. EXCEPT IN THE PROCESS OF DELIVERING THE 6, WE ATE THE ENTIRE SHIPMENT OF COOKIES FROM HAWAII.. WHICH SHE HAS OFFERED TO REPLENISH FOR PI'S DELIVERY IN ABOUT A WEEK. SO WE SIT AROUND ANALYZING EVERY PHART.... IT IS CALLED.
. SO I WENT AND BOUGHT ONE YESTERDAY. NEXT PROBLEM IS HOW TO MANAGE IT. IT CERTAINLY IS A GOOD IDEA CONCEPTUALLY-- UNTIL SOMEONE CONSIDERS IT AN EMERGENCY TO REPORT "THERE IS A FLY IN THE BARN" OR- MORE PROBABLY "I JUST WANT TO TQLK TO EARLENE"
SOMEHOW WE HAVE TO GET AROUND THAT. START WITH-- WE BOUGHT A CHEAP PHONE WITH LIMITED MINUTES--- SO IT WILL NOT BE A CHAT LINE.. IF THE CAMERA PEOPLE SEE AN EMERGENCY THAT WE DON'T, THEN CALL- THE NUMBER IS 978 204 3736- IF THAt phone rings we will first GO TO MERLOW/ OR PI AT WHICH TIME I WOULD SUGGEST YOU HANG UP SO WE DON'T WASTE THE MINUTES. IF THERE IS A REASON TO SPEAK TO US- THEN STAY ON THE LINE - AND AFTER WE CHECK THE ANIMALS WE CAN GO TO THE PHONE AND ANSWER IT. THE PHONE ALSO IS A CALLER ID PHONE SO WE WILL KNOW WHO HAS CALLED. THE NEXT PROBLEM FOR WHICH THERE IS NO SOLUTION IS THAT THERE IS A 30 SECOND DELAY IN THE PICTURE- SO TAKE THAT INTO CONSIDERATION. FOR THAT WE ARE DEPENDENT ON THE CHICKEN BOARD.. WHICH -- I AM TOLD IS BACK UP (HIS SERVER WAS DOWN.) - I SPOKE TO MATT - HE GAVE ME THE LIST OF PEOPLE WHO PURCHASED BRICKS WHILE IT WAS DOWN- AND THE TRANSACTIONS WENT THRU FINE- EXCEPT FOR THE NUMBERS THEY PICKED... THERE ARE 10 ENTRIES I WILL HAVE TO GIVE OUT 23 "QUICK PICKS"
CHERYL,PATTI,SANDY,CARRIE , MICHELLE, MARTHA MARILYN,JANICE, ROBYN AND LYNNE WILL ALL HAVE NUMBERS OVER 1200 PLACED ON THE BOARD FOR THEM. THERE IS MONUMENAL SHIFTING AROUND OF DOGS-- COUPLE PEOPLE ARE ON VACATION-- NAMELY PERRY AND SCARLOTT ARE BOTH HERE..
HOPEFULLY THERE WILL BE ENOUGH PEOPLE STANDING ROUND WAITING FOR PUPS THAT WE CAN GET THAT DONE.. THERE ARE SUPPOSED TO BE A BUS LOAD OF PEOPE FROM BROOKSBY VILLAGE HERE TODAY. BAILEY AND PILL TAKING.. WE STARTED WITH THE USUAL SPOON FED METHOD OF ISSUING PILLS -- AND FOR EVERYONE ELSE- IT WORKS PERFECTLY. A SPOONFUL OF CANNED... NEXT SPOONFUL SCOOP THE PILL TOO THEN ANOTHER SPOONFUL FOR CHASER. EXCEPT BAILEY FOUND THE PILL THERE ONCE TOO OFTEN- SO SHE IS SUSPICIOUS OF EVERY SPOONFUL-- WITH THE 3 DANES IN HERE-- YOU CAN GET 1/2 THRU T CAN BEFORE SHE WILL RISK A TASTE. INTERESTING-- IF I STAND THERE AND SCOLD HER ABOUT IGNORING THE PILL AND TAKING IT.. SHE WILL.. SO I THINK WE SHOUJLD TRY PUTTING HER PIL IN ONE SPOONFUL IN AN OBVIOUS DIFFERNT SETTING AND INSIST SHE TAKE ITT... OR IT GETS POKED DOWN HERT THROAT IN A "NORMAL " WAY.. HER CHOICE..
HOW SHE SEES THAT COULD BE INTERESTING. WE NOW HAVE AN A/C IN THE DEAGLE HOUSE-- AND I AM TOLD WE HAVE ANOTHER IN THE CELLAR FOR THE NUTT HOUSE. 2 WENT WITH THE OLDER VETERANS I.E. OVER 65... BUT THEY MATCHED THE DOGS PRETTY WELL-- AND SO FAR SO GOOD. THE DENTIST TO FIX MY CHIPPED TOOTH THAT IS CURRENTLY ADDING TO MY PERSONA..
ORDER 2 BENCHES HEAVY ENOUGH SO THE NEIGHBORS BOYS CAN NOT REMOVE IT. ?GRANITE? MAYBE PAUL CAN"LANDSCAPE THE BEND OF THE DRIVE WAY SO WE CAN PUT IN A SMOKERS BENCH THERE.-- BY OCTOBER WE ARE GOING TO NEED IT..
MY GREEN GOLF CART IS BACK... WITH NEW BATTERIES.. I GUARENTEE I DID NOT BUY THESE- BECAUSE FOR YEARS I HAVE BOUGHT ONLY NEW BALANCE AT THE OUTLET STORE IN LAWRENCE (UNDER THE CLOCK TOWER IF YOU NEED THAT INFO) I BUY 4 OR 5 PAIRS AT A TIME- AND HAVE NEVER... IN 20 YERS BOUGHT ANY OTHER SNEAKERS.. THESE WERE NOT NEW BALANCE SNEAKERS. SO I DIDN'T BUY THEM AND FORGET..
AND THIS IS NOT THE FIRST "EPISODE"
I WISHED I COULD GET UP A BETTER FENCE AROUND THE CHICKENS AND 15 PEOPLE FROM J&J SHOW UP AND WORK LIKE CRAZY PEOPLOE FOR 5 HOURS-- BEAUTIFUL JOB !! IF I HAD A BETTER MEMORY I WOULD REMEMBER DOZENS MORE..
DO YOU KNOW OF ANOTHER CHARITY THAT HAS AS THIER 2 PRIMARY VOLUNTEERS A LICENSED PLUMBER AND LICENSED ELECTITIAN?- ADD TO THAT AN AMAZING VOLUNTEER COLLECTION OF TALENTS. THERE IS A MORE VARRIED VOLUNTEER COLLECTION ???? AS FOR OUR "PAID STAFF" TAKE THERESA-- THERE IS NOT A MORE PLEASENT PERSON AROUND-- I CAN GET A SKATHING EMAIL FROM SOME IRATE PERSON, AND WRITE ON IT "TELL THIS SOB TO GO TO H#LL" AND SHE WRITES THE MOST PLEASENT TIDY LETTER WISHING HIM WELL ... ALL SPELL CHECKED AND ALL. MEGAN MARIA TRACY -- ALL DO A FANTASTIC JOB-- HOW DID WE INHERIT THEM??? WELL,... I ... FOR ONE, AM BEFUDDLED. I THREW MY CLOTHES INTHE WASHER-- IT IS ONE OF THOSE FRONT LOADERS WHERE THE DOOR LOCKS.... I START TO GET IN THE SHOWER AND THE "I HAVE FALLEN AND I CAN'T GET UP" MACHINE IS SAYING "WE ARE CALLING FOR EMERGENCY HELP". I REALIZED THE BUTTON THING MUST BE TANGLED IN MY SHIRT THAT IS IN THE WASHER-- DOOR LOCKED SHUT-- I NEED TO GO VERY QUICKLY GO AND PUSH THE OTHER BUTTON AND TELL THEM IT IS NOT AN EMERGENCY .. IF I FAIL TO DO THAT, THE FIRE DEPARTMENT WILL BE UP THE DRIVEWAY SIRENS BLARING. THAT BUTTON IS OVER BY THE COFFEE MAKER -- I DON'T HAVE ON A STITCH. NOW..... WHICH WAY IS THE EXPLORE CAMERA FACING..??? PEOPLE JUST DON'T REALIZE THE PROBLEMS I FACE ON A DAILY BASIS..
WE ARE DOING WELL WITH ALL THE "MISTERS" WHICH THE CAMERA PEOPLE HAVE DONATED-- THE PLACE IS LIKE A RAIN FOREST- BUT T LEAST IT IS A COOLER RAIN FOREST... THOSE 24 "BOX FANS DO A GREAT JOB WITH A MISTER. I HAVE ONE FAN SET UP TO BLOW OUT OF THE DEAGLE HOUSE INTO A NET-- AND IT IS BEGINNING TO CATCH MOSQUITOS ABOUT 1/4 A CUP YESTERDAY-- THAT IF FAR MORE THAN THAT $500 MOSQUITO MAGNET EVER THOUGHT OF CATCHING. BLUE GWEN AND THERESA PERFOPRMED THE DUTIES OF THE SHIPPING DEPARTMENT LAST NIGHT.. WE NEED TO HAVE TH EPUZZLE ORDER ARRIVE SOON... I THINK TH E WORD IS "BACKORDERED??" Thanks so much for you advice yesterday morning. We took your advice on how to get our three dogs settled down and worked yesterday to "achieve boredom". Its really gone well. Right now Isabelle our 11 lb mini poodle is sitting on my left, Chloe our 18 lb mini labradoodle is asleep across from me and Oliver is comfortably spread out on the floor sound asleep. I took a walk with all three dogs in the woods, and they all had a great time exploring and sniffing. Oliver met several people today and was quick to warm to everyone. Most importantly,Peter. Oliver and I walked half way down our road and Peter did really well. He was tuckered out but pleased. It's the first time he has walked on this road in several years! Oliver is a terrific dog with a very good disposition--he is a credit to the way you raise and socialize your pups . HOWEVER -- THEY HAVE PROVIDED THE FUNDS TO BE ABLE TO AFFORD IT --- IN THE FUN FUND JAR-- SO I WILL GO AHEAD .. PAUL'S IMMEDIATE COMMENT WAS "THEY WILL ALL CALL JUST TO SPEAK TO EARLENE"
THEY WILL HAVE TO BE EDUCATED-- BECAUSE I AM VERY CAPABLE OF PUTTINIG IN OUR AMBULANCE. A FEW MORE STORIES FROM INDIVIDUALS AND THEN LOCATE THE PICTURES. I AM SO GLAD WE LIVE IN A PAPERLESS SOCIETY-- I HATE TO THINK HOW MUCH PAPER I WOULD GO THRU IF IT WAS NOT PAPERLESS. MOST SPECTACULAR NEW S-- THE POWER OF WHATEVER IS STEERING US AROUND... YESTERDAY I SAID I HOPED SOMEONE WOULD SHO W UP FOR STEW WHO COULD CUT MY HAIR..
GOTTA BE CAREFUL WHAT YOU WISH FOR ON THIS DD THING. AS YOU CAN TELL FROM THE CAMERAS PI IS LARGE.. MERLOW IS NOT LARGE.. SHE IS OBVIOUSLY PREGNANT-- BUT NOT HUGE.. PI HAS A WEEK/10 DAYS TO GO SO SHE HAS YET TO BLOSSOM OUT. PI HAS CLAIMED THE TV ROOM AND MERLOW THE KITCHEN SOFA BY THE COFFEE POT. ?SINCE WHEN DID WE HAVE A POT FOR COFFFE? SHIELA GETS THE GOLD STAR FOR CHIPPING BEEF AMID ALL THE FLIES WHICH AHD ACCUMULATED IN THE GARAGE. ALL OF US IN THE T TENT NOTICED A TOTAL LACK OF BUGS-- I GUESS THEY WERE ALL IN THE GARAGE CHIPPING BEEF..
LOTSA SOAP AND HOT WATER... AND A BUNCH OF STUFF FOR THE DUMPSTER.. IT SHINES NOW. AND BENJAMIN BUCKWHEAT IS ALMOST EATING TREATS OUT OF PAUL'S HAND. WE HAVE A PARADE TO DO AT BROOKSBY ON FRIDAY IT IS THEIR 4TH OF JULY PARADE-- ANYBODY GOING TO BE AROUND TO HELP?? PROBABLY JUST THE BED... BB IS NOT THAT RELIABLE YET.. AT LEAST AT THE MOMENT. WHAT HAPPENED TO MY SOUP[ SPOON THAT I DUG POST HOLES WITH FOR THE NUTT HOUSE... THAT WAS MY FAVORTIE DIGGING DEVICE-- LOOKED RIDICOULOUS BUT IT WAS EFFICIENT.. AND I NEED IT. JUST MEASURED-- ELBOW 16" HEIGHT 31.5"
I EXPECT OUR EFFICIENDCY TO GO THRU THE ROOF. PETER LEFT WITH OLIVER-- AND HIS WIFE ---- TO GO TO THEIR HOME IN MAINE-- THEY ARE OFTEN DOWN THIS WAY AS THEY HAVE A PLACE ON PLUMB ISLAND. I THINK HE CAN MEET THE GOALS SET IN HIS APPLICATION-- I HAVE THREATENED THEM WITH THE CURSE OF THE FIRE ANTS IF THEY DO NOT STAY IN TOUCH-- OLIVER IS A HUGE FAVORITE OF ALL THE VOLUNTEERS- SO WE NEED TO KNOW. AND THE BED PROJECT... MAYBE KURANDA COULD PUT TOGETHER A HUGE REPLICA OF THIER BEDS FOR US TO USE IN PARADES-- AND HERE INTHE YARD.. THEY WOULD HAVE TO HAVE SOME KIND OF TIDY SIGN ON THE RAIL.. I HAVE VISION OF 4" PVC OR MAYBE 6"-- HOLDING UP WHAT LOOKS LIKE A FLOOR SO IT LOOKS LIKE IT IS STANDING .. .
JAMMIES WOULD HAVE TO BE SEWN SPECIALLY-- BECAUSE FROM MY YEARS OF DOING PHOTO'S FOR DOG CLOTHING CATALOGS I KNOW ALL THOSE PHOTO'S WERE POSSIBLE ONLY AFTER WE SLIT THE JACKETS AND DUCT TAPED THEM TO THE MODEL DOG. AND PI IS DUE TO ARRIVE FOR HER " CONFINEMENT????" DO THEY STILL CALL IT THAT???? I have a fly trap report. I have been under the weather and am starting to wonder if I have low grade Lymes. I figured that the traps could be tested on my bugs as well as yours. *I did get another of the yeast/water traps made. Result- a loser. I think the carbon dioxide production ceases if trap goes below 50 degrees. What do people expect? *ordinary soda bottle trap with the yeast/sugar water and chunk of meat suspended on fishing line and safety pin. Surprisingly, this one was a flop. *dirty sock trap. Unfortunately I didn't think of the safety pin and fishing line trick and the sock fell into the yeast solution. A flop. Might be worth trying with sock suspended better. *Most promising. soda bottle trap with plain water. Mosquito lays eggs in/on water. The egg/larva sinks to bottom of bottle. Larva does its developmental things at bottom of bottle. When it is ready to surface and fly away to annoy us it does not escape because of the inverted cone of the soda bottle. BONNIE... I HATE TO TEMPT FATE... BUT WE HAVE HAD DAMN FEW MOSQUITOS SO FAR.. SO YOUR TEST MAY NEED TO BE REPEATED.. EVEN MY FAN/NET CONTRAPTION HAS ONLY A FEW..
WE ATE LOBSTER IN THE T TENT THE OTHER NIGHT WITHOUT ONE BUG. SHORT DOGGIE TODAY-- I HAVE TO USE MY LIMITED WAKING HOURS ON THIS BOOK I AM SUPPOSED TO BE FINISHING. LIKE DOORS AND SPEED. THEY TOOK HIM TO PLUM ISLAND FOR THE NIGHT. LUNA WENT WITH SUNDAY SANDY FOR A COUPLE OVERNIGHTS-- I THINK SHE WILL BE PLEASE TO HAVE THE ATTENTION SHE DESERVES..
JANINE-BLESS HER- ARRIVED WITH 2 BUNNIES THAT NOW LIVE IN THE CHICKEN AREA.. WITH DIFFICULTY KARLA'S 2 BOYS ( LARGE SIZE BOYS) HELPED CARRY INTHE 6 X 12 ' DOG KENNEL THAT WAS IN THE ARENA- IT WAS THEN DISCOVERED A BUNNY CAN SQUEZE THRU CHAIN LINK... SO WIRE WAS CUT TO COVER THE AREA. LAST SEEN THE CHICKENS WERE TRYING TO DIG IN AND THE BUNNIES WERE RYING TO DIG OUT. AND I SAT AROUND AND SNOOZED OVER THIS BOOK. I AM SURE THE DRAGON SOFTWEAR IS GOING TO BE FOR THE SEQUEL.. I CAN NOT DICTATE AND THINK... AT LEAST YET..
SATURDAY CREW SHOUDL BE HERE SHORTLY- ACTUALLY I THINK MARIA IS UPSTAIRS. OUR CHICKEN BRICKS ARE DOING SUPER BECAUSE SOMEONE BOUGHT ONE BRICK AND MADE AN $1000 DONATION ON TOP OF THAT. MY CHALL;ANGE OF THE DAY? I AM SO EXCITED.. I WROTE THE FIRST 2 SENTANCES OF THE BOOK. THAT WAS THE HARD PART... ADDING THE REST WHICH I HAVE ALREADY DONE IS JUST A MASSIVE SPELL CHECK PROBLEM.. WELL IT IS MORE THAN THAT.. IT IS ALSO FIND IT.. BECAUSE I CARRIED PAPERS AROUND FOR A LONG TIME-- AND THOSE 3 X 6 POOPER SCOOPERS MAKE GREAT NOTE CARDS TOO- ALONG WITH SHOE HORNS. AND THEN I GOT THRILLED WITH THE TALK TO PRINT DRAGON SOFTWARE...- SO ALOT OF IT IS ON THERE.. PROBLEM THERE IS I TOOK THE DRAGON PRINT STRAIGHT FROM MY DICTATION BEFORE I READ THE "DRAGON FOR DUMMIES" BOOK AND FOUND I SHOULD BE DICTATING THE PUNCTUATION . SO THERE IS A LUMP OF THE BOOK WHICH IS NOW THE WORLDS LONGEST RUN ON SENTANCE..
GUINESS RECORDS HAVE ALWAYS BEEN A GOAL OF MINE. BUT IT IS ON PAPER.. I THINK WE COULD PUT THAT OUT AS A PUZZLE BOOK. THE DRAGON PROGRAM HAD SOME EXTREMELY UNUSUAL TRANSLATIONS OF THE WORD "TEAL"
BLESS THE CAMERA PEOPLE-- THERE IS ONE.. IN NEW YORK.. WHO IS A DRAGON INSTRUCTOR WHO HAS OFFERED TO HELP. IT IS SIMILAR TO BEING ABLE TO WALK AND CHEW GUM. BUT I BETTER GET IT DONE BECAUSE JANINE NEEDS SOME OF THE PROFIT TO PAY HER MORGAGE- OR SHE WILL LAND BACK HERE LIVING INTHE TRAINING ROOM.. WHICH IS HOW THIS WHOLE THING STARTED. AND THAT IS JUST ONE OF MY DIFFICULTIES WITH IT. I COULD GIVE UP-- BUT THEN WHAT WOULD I DO WHILE I DRANK MY COFFEE?? A REPORT FROM LAST NIGHT'S DINNER-- I BET YOU CAN'T WAIT TO HEAR... WELL. I COULD FILL UP THE DAILY DOGGIE WITH THE DETAILS DOWN TO THE LOBSTER BIBS -LEMONAIDE AND AFTER DINNER MINTS.. IT WAS A TRIAL RUN FOR THE OCTOBER SURPRISE-- OR WHATEVER THAT WEEKEND OF CAMERA PEOPLE IS NOW BEING CALLED. IT IS MY IDEA OF ENTERTAINING-- ONE BIG WHITE BOX YOU PICK UP AND DON'T HAVE TO THINK AT ALL.-- IT HAS EARNED A PLACE ON MY CELL PHONE---- 2050--. PETER AND OLIVER ARE BONDING NICELY-- OLIVER IS VERY RELAXED-- PETER AND HIS WIFE WILL HAVE TO WORK ON THE RELAXING PART... I THINK ONE O THE PROBLEMS IS THEY HAVE NEVER HAD A DOG YOU JUST SPEAK TO AND HAVE THEM BEHAVE ON THE BUTTON.. SO THE LOBSTER DINNER WITH OLIVER AND CHAOS ROAMING THE AREA WITHOUT ANY TABLE SURFING WAS A LESSON IN ITSELF.. I AM LOOKING FORWARD TO MR KURANDA BEDS WHO IS ARRIVING SOMETIME TODAY.. BUT THAT IS ALL I CAN THINK OF. I REALLY MUST GET THIS BOOK IN ONE COHESIVE LUMP .. TYPED.. PAGES NUMBERED KIND OF THING..
CGA---CARLENE'S GRABASS METHOD OF MOBILITY..I HAVE BEEN ASKING POTENTIAL CLIENTS PRACTICE WALKING BY HOLDING THEIR PARTNERS BACK POCKET-- OR BELT.. THIS APPROXIMATES WHERE A DOG'S HARNESS WOULD BE-- AND ARM HOLDING IS TOO VARIABLE//-- I THOUGHT IT WAS PRACTICE ONLY-- NOW I AM GETTING RESPONSES LIKE THE ONE BELOW-- SO IT DOES BEAR ANOTHER THOUGHT..
HELLO, ALL MY WONDERFUL CP'S!! I DID IT!! I WENT FOR A WALK HOLDING ON TO MY HUBBY'S BELT. THE FIRST WALK IN OVER TWO YEARS!! HURRAY! MIND YOU, IT WAS PAST A COUPLE OF DRIVEWAYS, THEN SIT IN THE WHEELCHAIR WHILE HUBBY PUSHED ME ALONG, THEN A COUPLE OF MORE DRIVEWAYS AND SO ON FOR A TOTAL OF 4 LITTLE WALKS. I WAS MORE WINDED THAN ANYTHING, BUT I DID IT; I'M SO HAPPY! I'LL TRY TO GET OUT EVERYDAY. THANK YOU, CARLENE FOR YOUR TIPS; IF YOU HAVE ANY MORE HANDY HELPERS, I'D LOVE TO HEAR ABOUT THEM.. SO NOW.... THERE ARE TIMES WHEN THIS CGA METHOD. MIGHT BE AN IMPROVEMENT OVER THE STOOP AND TRUDGE METHOD. WE NEED MORE INPUT-- ALL YOU FOLK ON WALKERS ETC-- FIND A PARTNER AND TRY IT. CANE AND WALKER BOTH DEMAND YOU BEND FORWARD IF THERE IS THE SLIGHTST CHANCE OF TIPPING BACKWARDS AS MANY PK DO... THE 2 CRUTCH METHOD DOES NOT ALLOW NORMAL MOVEMENT EITHER...THE CGA METHOD ALLOWS YOU TO STAND UP STRAIGHT. WORDS LIKE CENTER OF GRAVITY AND COUNTERBALANCE COME TO MIND. AND THE OTHER FINDING-- THIS MAY BE ANOTHER ACCIDENTAL DISCOVERY-- HAVING BEEN THE POCKET WEARER-- I CAN VOUCH FOR THERE ARE MORE UPPIES THAN DOWNIES..
OR DO WE CALL THEM ----WEDGIES vs STRIPPERS???? I HATE TO REMIND ALL YOU PEOPLE WHO LOVE HAVING HIM... HIS STALL NEEDS ATTENTION-- SO VOLUNTEERS... IF HE IS UP ON THE HILL-- THERE IS PITCHFORK AND WHEELBARROW RIGHT THERE. I HOPE THAT SNACK OF HAM DID NOT HIT HOME AT AN INOPPORTUNE TIME.. I THINK MAGGIE'S NEW OWNERS WILL PICK HER UP TODAY. AND PETER AND OLIVER ARE DOING WONDERFULLY-- BOTH PETER AND WIFE ARE A BIT OF A NERVOUS WRECK-- BUT THAT SHOULD GO AWAY AS THEY GET MORE MILES ON THEM. GOAL OF THE DAY?? THIS DRAGON PROGRAM OF TALK TO PRINT SYSTEM IS SET TO GO IN MY COMPUTER.. I HAVE TO READ IN SAMPLE SPEECH-- AND THIS IS THE ONLY TIME OF DAY I IS QUIET ENOUGH.. HAPPY 19th - THERE... THAT GETS RID OF ALL THE BIRTHDAY/ANIVERSARIES I WAS SUPPOSED TO REMEMBER FOR THIS MONTH. DOING ALL THE WELL WISHING ON ONE DAY-- THE 19th--- CERTAINLY SAVES ALOT OF TIME AND EFFORT. 14 ADULTS DUE HERE TO VOLUNTEER -- I THINK THEY WILL BE ABLE TO PUT UP A NEW CHICKEN FENCE...-- THIS WILL ALSO GIVE US ANOTHER PUPPY PEN DOWN NEXT TO THE T TENT.. I GOT A BIGGER DUMPSTER IN CASE WE COULD CLEAN THE ARENA ALSO.. I GUESS THE MOST TOUCHING WOULD WORK TOO-- EXCEPT I ALREADY USED THE TEAL AND 57 STORY.. WHEN YOU EMAIL ME WITH STUFF USE DOG STORY AS THE TOPIC SO I CAN SEE THEM..
-- IT IS AMUSING I GUESS....-- MOSTLY BECAUSE OF WHT WE CONSIDER NORMAL-- WHICH IS WHAT ALSO MAKES IT HARD TO WRITE-- BECAUSE I DON'T SEE ANYTHING AMUSING ABOUT CALLING UP SOMEONE AND ASKING TO BORROW 4 PIGS FOR THE DAY. SHE PUT TOGETHER THE ANIMAL EPISODES YEARS--AND LEFT ME WITH TRYING TO EXPLAIN WHY I BASICALLY LIVE IN A DOG KENNEL NOW. I WAS TRYING TO HELP THE CONVERSATION IN THE ECAD 'S EXPLORE AND SAID SOMETHING ABOUT LU USING SHAVINGS WITH HER PUPS--AND WITH LONGER HAIR THAN DANES, EVEN CLEAN SAVINGS AND PUPS LOOKED DISHEVELED- ----- ONE OF THE CAMERA PEOPLE CAME BACK AT ME- THINKING I WAS BEING CRITICAL OF LU-- AND COMPARED MY DISCHEVELED KITCHEN TO LU'S PUPPY PEN..
AN INTERESTING COMAPRISON... I AM SURE BOTH ARE CLEAN- BUT THE GENERAL ORGANIZATION MAY BE HARD TO UNDERSTAND.. ALONG THOSE LINES WILL EVERYONG PLEASE EAT MORE POTATO CHIPS-- EVEN THE CAMERA PEOPLE THINK THE AMOUNT OF POTATO CHIPS ON THE COUNTERS IS EXCESSIVE.. THERE ARE NEARLY AS MANY BROWNIES TOO..
AND THEN THERE WAS THE CAMERA PERSON WHO DECIDED MEGNAN WAS TOO ROUGH WITH ONXY BECAUSE THEY THOUGHT ONXY HAD PEE'D ON THE FLOOR WHEN IN FACT MEGAN WAS PREVENTING AN ARGUEMENT FROM STARTING BETWEEN MERLOW AND ONYX. PRETTY FUNNY BECAUSE OF THE AMOUNT OF PEE ON THE FLOOR WE DEAL WITH DAILY---- IF SHE IS GOING TO GET UPSET AT THAT--- WE ARE ALL IN TROUBLE. IT STRIKES ME AS A PARTICUL.ARLY POOR DECISION TO DO SOMETHING LIKE THAT WHEN YOU CONSIDER THE AMOUNT OF OUR TAX DOLLARS WENT TO TEACHING HER HOW TO STRANGLE SOMEONE WITH HER BARE HANDS IN THE MILATARY..
BECKY #1 SUGGESTED SHE CALL ELAINE ALANIS WHO IS SOME KIND OF DISCRIMINATION ATTORNEY IN BOSTON---- I GUESS JADE USED HER WHEN THE MGR OF A CUMBERLAND CALLED HER A B#TCH FOR INSISTING HER DOG STAY WITH HER. JADE HAS A NEW TRUCK..
NAMELY A NEW CHICKEN FENCE... HOPEFULLY. YES, YOU HIT THE NAIL ON THE HEAD – THEY ALL HAVE THEIR LITTLE QUIRKS, DON’T THEY. OUR PREVIOUS BOY, REB, WOULDN’T DO STAIRS (EXCEPT FOR THE ONES GOING INTO OUR HOUSE AND THE VET), AND HE HAD SOME WEIRD ‘SPATIAL’ ISSUES, WHEREAS PATRICK GOES UP AND DOWN DECK STAIRS NO PROBLEM, GOES INTO THE CITY, CROSSES BUSY STREETS, ETC. WHO KNOWS WHY HE’S AFRAID OF THE SCENTED BABY WIPES (I WENT OUT AND GOT THE UNSCENTED ONES – PROBLEM SOLVED). THEY’RE ALL INDIVIDUALS, RIGHT?! TRY THIS-- WE PUT AN APPLICANT INTHE GUEST HOUSE COMMON ROOM WITH A DOG AND IMMEDIATELY THE DOG IS PETRIFIED OF THEM-- AND WE GET A "WHY ME" ?? TO TRY AND ANSWER..I HAVE SUGGESTED MAYBE IT WAS SOME SCENTED SOAP ETC... BUT HERE IS A DEFINITE ID. AND WE HAVE SCENTED BABY WIPES AROUND..
JUST BECAUSE WE THINK ORANGES SMELL NICE-- THE DOGS MIGHT PREFER AN AIR SPRAY OF METHANE GAS OR A QUICK SQUIRT OF COW DUNG. I GUESS MY LESSON OF THE DAY IS-- GO FOR THE UNSCENTED.. I PUT IT WHERE THE PUPPY HILL CAMERA CAN SEE IT- IF IT RAINS AND THE PUPPIES ARE NOT OUT ON THE HILL--- , THEN ALL THESE THOUSANDS OF CP's CAN COMMENT ON EVERYTHING WE THROW OUT. DON'T LAUGH--- LU PICARD--- OF EAST COAST ASSISTANCE DOGS-- NOW HAS A CAMERA ON HER PUPS-- AND THE CP's ARE HAVING A FIELD DAY BECAUSE IT IS NOT AS AMUSING AS OUR SETUP..
FOR OPENERS, SHE HAS FUZZY PUPS AND WOOD SHAVINGS-- SO WHATEVER SHE DOES IT LOOKS UNKEPT..
WE HAVE GOT TO THE STAGE OF "NOT MUCH AMAZES OUR CAMERA CROWD" THANK HEAVENS. RAISING PUPPIES IS NOT AN EXACT SCIENCE-- WE DO THE BEST WE CAN AND I THINK WE HAVE EDUCATED THE CP'S TO THE POINT OF REALIZING THAT. THERE WILL ALWAYS BE SOME WHO JUST WANT TO RUFFLE FEATHERS-- AND THEY USUALLY HAVE A LEADER WHO IS LIGHT ON FACTS AND JUST IN NEED OF A GROUP TO LEAD. IT HAPPENS. NOW WHY SHOULD THE US CONGRESS COME TO MIND...??? WE HAVE THE MOST AMAZING VOLUNTEERS STARTING WAY BACK... JUST TO MENTION A FEW.. WHEN YOU NEED ONE, THERE IS NO SUBSTITUTE.-- I NEED TO BE READY IN CASE A DOG THINKS IT MIGHT BE FUN TO CHASE BB. A DOG CAN BE TAUGHT TO KEEP 10 FEET AWAY FROM BB-- IT WILL TAKE CONSIDERABLE ORGANIZTION OF DONKEY AND DOG... THE DOG HAS TO THINK THE DONKEY DID IT. ANYONE WHO THINKS THAT IS UN NECESSARY, PLEASE SUBMIT YOUR PLAN IN WRITING. ONE OF THOSE COLLARS IS A VIBRATE ONLY COLLAR-- IN PREP FOR A DEAF PUP.. I HAVE NOT HAD TO USE HAT YET EITHER.. BUT WE ARE READY. THE OTHERS HAVE A GRADUATED SHOCK--#4 AND ABOVE MAKES ME DROP THE COLLAR. THIS WILL BE A SHORT DOGGIE. THE 6'3 GUY SHOULD BE COMING TO START WITH OLIVER..
SHELIA AND I HAVE TO CONCLUDE THE ARGUEMENT ON HOW TO KEEP THE DEAGLE HOUSE FROM SLIDING DOWN THE HILL. MUST START LEASHS WITH THE PIMENTOS.. I BELIEVE WNSTON IS GOING TO LIVE WITH DEBBIE ( DETAILS YET TO BE DETERMINED) HE IS THE HEALTHIEST DOG WITH A BROKEN VERTABRAE THAT I HAVE EVER SEEN--AND I WANT TO GET HIM OUT OF HERE BEFORE ANOTHER DOG BREAKS MORE OR WHATEVER... HE PLAYS ROUGHLY. MERLOW IS ARRIVING AT 7:30 AND I HAVE FORGOTTEN JUST WHO IS HER FRIEND AND WHO IS NOT...GOT TO FIGURE THAT OUT AND SHIFT DOGS ACCORDINGLY.. SHE WILL HAVE TV ROOM PRIVILIDGES.. FATE IS THE HUNTER.... SHE IS DUE HERE ABOUT THE DAY TRACY IS LEAVING FOR VACATION-- I DON'T HAVE A CLUE WHO SHE IS.. EXCEPT SHE IS A CAMERA PERSON. WE HAD SOMEONE HERE YESTERDAY 2 CRUTCHES AND A HUGE HUSBAND- WITH DIFFICULTY I PURSUADED THE HUSBAND TO OFFER HIS BACK POCKET TO HIS WIFE -- INSTEAD OF THE CRUTCHES AND SHE QUICKLY SAID WHAT A JOY TO STAND UP AND WALK IN A NEARLY NORMAL FASHION.. THEY APPARENTLY ARE PRACTICING MY BACK POCKET ROUTINE AND HE SAID HE IS MUCH MORE COMFORTABLE STANDING UP STRAIGHT. I AM BEGINNING TO SOUND LIKE I KNOW WHAT I AM TALKING ABOUT-- DON'T LET THAT FOOL YOU... I DON'T. BUT--- WITH ALL WALKERS AND CANES THERE IS A CENTER OF GRAVITY PROBLEM WHERE IN ANTICIP[ATION OF GOING OVER BACKWARDS- THEY OVERCORRECT AND BEND FORWARD WITH THE WALKER.. THE CARLENE METHOD- AT LEAST FOR SHORT RUNS INTO RESTAURANTS ETC-- IS TO LEAVE THE WALKER IN THE CARR AND HANG ONTO SOMEONE'S BELT-OR POCKET. BECKY-- SITTING BEHIND ME-- AN RN-- WELL VERSED IN BOTH GENERIC MEDICAL AND CRUTCHES ETC BECAUSE HER DAUGTER JADE HAS USED ALL SORTS OF APPARATIS WITH HER FREDERICKS ATAXIA....BECKY HAS NEVER HEARD OF THIS "CARLENE'S BACKSIDE METHOD" . ALOT OF PEOPLE COME IN PAIRS-- SO THERE ARE MANY TIMES WHEN THE BACKSIDE METHOD IS ALOT MORE CONVENIENT ALONG WITH BEING BETTER EXERCISE WITH STANDING UP STRAIGHT. I THINK I AM READY FOR SOME REAL PUBLICITY AND SCIENTIFIC TESTING OF MY BACKSIDE METHOD. AND I NEED A CAMERA PERSON TO COLLECT THE DATA.. CLOUD??? CAN YOU STAND MORE WORK? BB's ARRIVAL- WAS ALMOST UNEVENTFUL-- WE LET HIM STRETCH HIS LEGS IN THE POND AREA- THEN PAUL CAUGHT HIM AND WE MOVED HIM TO PUPPY HILL SO EVERYONE COULD GET A GOOD LOOK, AND HE COULD GET SOME REST..
WE NEED TO BE CAREFUL OF THE WATER BUCKET... HE IS DRINKING OUT OF THE STAINLESS STEEL BUCKET.. BUT HE IS CLEARLY AFRAID OF IT.. IF THE HANDLE MAKES THE SLIGTEST NOISE HE JUMPS BACK-- -- SO WE NEED TO REDO THE BUCKET DEAL TODAY WITH WHITE COSTCO BUCKETS-- HE HAS A NORMAL HORSE BUCKET IN HIS STALL. THE OTHER MAJOR PROBLEM IS THE MINI DONKEY IS IN HEAT-- AND HE WAS NOT GELDED LONG AGO- SO HE IS INTERESTED.. LUCKILY FROM THE OTHER SIDE OF THE FENCE-- AND JANINE'S 17 HAND HORSE IS VERY CONFUSED BY THE ENTIRE THING.. THERE WAS ALOT OF GALLOPING IN CIRCLES AND BRAYING. I HAD TO PUT HIM IN OVERNIGHT -- HE WAS ALREEADY WORKING ON THE STALL DOOR WHICH GOES OUT TO THE PASTURE WHEN I LEFT- COUPLE THAT WITH JANINE'S BLACK HORSE HAS DOOR OPENING DOWN PAT- AND UNDID THE LATCH TO THE ALLEY TWICE BEFORE I GOT IT TIED SHUT. SO THERE IS SOME CONFUSION-- MOSTLY CAUSED BY THE LITTLE FEMALE RESCUE DONKEY-- I AM WONDERING IF JANINE HAS A HOME FOR HER... SOON???? SHE IS AMUSING GALLOPING AFTER THE 17 HAND BLACK HORSE- WHEN SHE IS 32 INCHES TALL. BU FOR A WHILE SHE WILL BE VERY UPSETTING TO BB. TO GET THIS DISCUSSION OUT OF THE WAY TO START.... WILLIAM SHAKESPEAR DECLARED THE DONKEY TO BE THE BEST ENDOWED MALE ANIMAL- I HAVE SEEN NO REASON TO ARGUE WITH THAT. SO ALL YOU CAMERA PEOPLE WHO ARE NEW TO FARM LIFE-- PLEASE DO NOT CALL ME AND TELL ME HE HAS 5 LEGS. LAURA DID A GREAT JOB OVERNIGHTING-- CAMERA PEOPLE LOVED HER-- AND GOT SOME GREAT SCREEN SHOTS OF HER SLEEPING WITH THE DOGS.. THE PLACE IS CLEAN AND THE CP'S HAD GLOWING REPORTS. PLUS HER PARENTS BROUGHT CHINESE FOOD FOR SUPPER LAST NIGHT..
WE FINALLY GOT THRU MOST OF THE SANDWICHES YESTERDAY. HOPEFULLY MINOR DSASTER TO REPORT-- I HAVENOT BEEN DOWN THIS MORNING YET-- COULD BE MAJOR DISASTER... WE HAD 4 DEAD CHICKENS YESTERDAY WITH THE HEADS GONE. THAT WILL BE A RACCOON-- MAKES NO SENSE-- THEY DON'T EAT THE CHICKEN-- SEEMS LIKE THEY JUST LIKE THE KILLING. IT IS NOT UNUSUAL FOR THEM TO GO THRU AN ENTIRE CHICKEN COOP AND LEAVE 50 DEAD HENS FOR NO APPARENT REASSON.. SEEMS FARMING IS A CASE OF OUTWITTING SOMETHING LL THE TIME-- AND SOMETIMES WE LOSE. SPEAKING OF LOSING..... OUR MAILBOX HAD NO ANTS TODAY- I DID GET AN EMAIL FROM SOMEONE IN WENHAM SAYING THIER MAILBOX WAS FILLED WITH ANTS TOO. MAYBE WE HAVE DISCOVERED SOMETHING REALLY STRANGE/ DANGEROUS-- THE MIGRATION OF ANTS BY FEDEX. I TOLD EARLENE TO GO HOME AND REST AND MARIA AND I WOULD MAKE A CASSEROLLE-- WE DO NOT POSSESS HER TALENT , BUT MAY PRODUCE SOMETHIGN AT LEAST NURISHING. GOT TO DO BETTER AT UTILIZING VOLUNTEERS-- MAYBE IF JACK GOT THE SHINGLES STARTED ON THE BACK OF THE TTENT WE COULD GET PEOPLE TO FINISH THAT-- AND SAVE HIS ENERGIES FOR MORE COMPLICATED CHORES. JUNE 15, 2013 added eta 10am TODAY-- I APPARENTLY AVE A PROBLEM WITH DATES..
NO WORD FROM PAUL AND EARLENE AS YET... I DON'T KNOW IF HE PACED HIS CELL CHARGER-- AND EARLENE'S LUGGAGE DID NOT MAKE THE TRIP-- SO THEY COULD BE RESERVING CELL USE FOR EMERGENCIES..
WHAT IS THE GESTATION PERIOD OF AN ANT??? THAT SECOND BOX COULD NOT HAVE BEEN IN our MAILBOX LONG ENOUGH FOR THE ANTS TO HAVE A SIZABE COLLECTION OF BABY ANTS-- SO THEY ARE COMEING FRO M SOME MAIL FACILITY SOMEHERE. I AM SURE I WOULD HAVE NOTICED THEM DURING THE PREP-- BUT I WAS NEVER TOO SURE IF THE MINK COAT WAS ACTUALLY THE SOURCE..
GOT TO CLEAN OUT THE BACK OF THE T TENT WHERE MARY USED TO STAND SO he COULD BE PART OF THE CROWD..
GOT TO REMEMBER DONKEY AND DOGS CAN BE A PROBLEM AND WE CAN NOT ASSUME HE WILL TOLORATE DOGS AROUND HIS FEET. DONKEYS ARE ALSO NOTED FOR NOT USING ANY MORE ENERGY THAN ABSOLUTELY NECESSARY SO THESE DOGS ARE IN FOR AN E-COLLAR SO THEY DON'T THINK OF TRYING TO CHASE BB. PAUL ATTACKED BY NASTY SANDWICH. -- AND SAVED BY A CAMERA PERSON IN TENN-- I COULD NOT MAKE UP THIS STUFF. SINCE HE WAS FELLING LESS THAN PAR.. EARLENE DECIDED TO FLY DOWN AND DRIVE BACK WITH HIM - SOMEHOW THAT FLIGHT AND ARRIVAL TIME GOT PUBLISHED SOMEWHERE -- AND SEVERAL PEOPLE WITH SIGNS WERE THERE TO WELCOME HER. FORTUNATELY IT WAS ALL IN GOOD FUN. APPARENTLY THEY WILL PICK UP BB TODAY AND START NORTH CHASING THAT RAINSTORM INSTEAD OF DRIVING THRU IT... HOPEFULLY. TODAYS DD IS EASY TO WRITE .. I HAVE SEVERAL TOPICS READY FOR ME..
AND AS SHE WAS DISHING IT OUT I HEARD BENTLY NO SEVERAL TIMES-- AND I REALIZED THEY ARE TRAINED TO RESPOND TO THIER NAMES SO QUICKLY IN THAT FEEDING ROUTINE -- THAT HE WAS BEING CORRECT IN HEARING HIS NAME AND LURCHING FORWRD SO QUICKLY HE NEVER HEARD THE ----NO--- PART..
AND THEN THER IS THE VOLUNTEER PROBLEM. WHEN WE WENT THRU THIS ACCREDITATION PROCESS-- I GOT VERY TIRED OF SHELIA ( O'BRIEN) SAYING " YOU HAVE TO HAVE A POLICY AND IT MUST BE WRITTEN"
WELL YESTERDAY... NO ONE WAS HURT... BUT WHAT I THOUGHT WAS AN EASY POLICY TO MAINTAIN... AN 11 YEAR OLD CHILD MUST BE WITHIN 11 FEET OF A PARENT.... DID NOT WORK AND RESULTED IN AN 11 YEAR OLD CHILD DRIVING WILDLY AROUND IN A GOLF CART HAVING A WONDERFUL TIME...... ALSO ENDANGERING PUPS AND ADULT DOGS ALIKE. PLUS... THE WORST PART--- LEAVING ME TO WALK TO THE BARN TO FIND A GOLF CART !!!! TRACY IS VERY PLEASENT AND ACCOMODATING--- WE LIKE THAT --- MOM HAD JU\ST A FEW ERRANDS TO RUN AND DID TRACY MIND? ----- OF COURSE SHE DIDN'T MIND..
WELL I SURE DID !!! I HAVE ALSO FOUND THAT WHEN SOMEONE AVOIDS ASKING MY PERMISSION IT IS BECUSE THEY ALREADY KNOW THE ANSWER. SOMEONE HAS TO BE THE SOB---- AND IN CASE YOU HAVE ANY DOUBTS-- THAT IS MY JOB. LET ME PUT IT ANOTHER WAY-- BABYSITTING IS $14000.00 AN HOUR. TRAINING CHILDREN TO BEHAVE AS WELL AS OUR DOGS--- IS EVEN MORE. THE FEAR I HAVE OF A DOG BEING HIT BY A GOLF CART FAR EXCEEDS MY FEAR OF A KID MANGLING THEMSELVES WHEN THE PARENTS DON.T WATCH THEM-- MY INSURANCE COMPANY FEELS DIFFERENTLY I AM SURE. AND THEN IF THEY -- THEIR PARENTS ARE WILLING TO MAKE A WEEKLY COMMITMENT PLUS MEGAN AND MARIA GIVE THEM A POSITIVE REPORT ON WORKMANSHIP----, WE CAN ALLOW THEM TO BA AN OFFICIAL VOLUNTEER WITH COMMUNITY SERVICE POINTS--- AND AFTER A BUNCH OF HOURS... MAYBE A SHIRT. - MAKING SOME 4" MONKEY FIST FOR WHICH WE HAVE ORDERS.. I HOPE HE REALIZES BB CAN LLIVE VERY HAPPILY IN THE TRAILER FOR SEVERAL DAYS-- IT IS JUST LIKE A STAll-- and if he has hay and water HE WILL BE FINE- SO IF PAUL IS TIRED HE SHOULD STOP AND SLEEP..
THEN TOO.. THIS IS NOT MARY --- WE STILL HAVE TO FIGURE OUT HIS PERSONALITY AND CERTAINLY CAN NNOT TRUST HIM AS WE DID MARY FOR A LNG TIME. ESPECIALLY AROUND DOGS. THIS MINI HERE CAN CERTAINLY KEEP UP WITH JANINE'S BIG HORSE WITHOUT SWEATING-- AND THE HORSE WILL BE DRENCHED. SHE FOLLOWS HIM AROUND THE POND AT A DEAD RUN.. DOING MILES. I DO NOT UNDERSTAND WHY WE ARE UNDER FLOOD WATCH.. LOOKS FINE TO ME RIGHT NOW. MICHELLE MOVED INTO THE GUEST CABIN WITH LOLA FROM THE TRAINING ROOM..
JUST BY CHANGING THE TERMONOLOGY... NO? DAVE TOLD US -- IN IRAQ THEY TORE THE INSIDES OUT OF 2 DIAPERS, SOAKED THE SHREADS IN WATER THEN STUFFED IT IN PANTYHOSE CUT TO APPROPRIATE SIZE AND PUT THE "PACKETS" INSIDE SHIRTS, UNDER HELMETS ETC. AND THE CAMERA PEOPLE HAVE SENT US 6 BOTTLES OF SKIN SO SOFT..... SO WE ARE READY.. APPARENTLY THE GROUP OF ADULTS DOING COMMUNITY SERVICE FOR THEIR COMPANY WILL BE HERE THE 19TH.. IF IT IS A NICE DAY THEY CAN PUT UP A NEW CHICKEN FENCE-- I HAVE THE MATERIALS COMING ( POSTS ARE HERE NOW HOWEVER.... IF IT IS A BAD DAY. THE ARENA AND HAY LOFT COUDL STAND A SPRING CLEANING.. SO I WILL GET A BIG DUMPSTER FOR THAT PROJECT. THESE CAMERA PEOPLE HAVE DONATED ENOUGH FOR A BENCH DOWN IN OUR SLOWLY GROWING PET CEMETARY. I GAVE UP SMOKING WHEN THEY WENT TO 50 CENTS A PACK-- AS BEING TOO EXPENSIVE-- NOW I JUST CAN NOT UNDERSTAND WHY FINANCIAL CONSIDERATIONS DON'T BECOME THE OVER RIDING ISSUE. I KNOW SOME EXTREMELY INTELLIGENT PEOPLE WHO SMOKE. I CAN NOT FIGURE THAT OUT. EXCEPT I CAN N OT SHAKE MY ADDICTION TO KLONDIKE BARS EITHER. AT LEAST THEY ARE NOT TAXED TO THE EXTREME ... YET. SPEAKING OF TAXES-- WE HAVE TO RESOLVE THE DOGGIE BAG AND STATE TAXES.. AND MAYBE USE THE WORD DONATION MORE FREELY??? THE NEXT OCCUPANTS OF THE GUEST HOUSE ARE HUSBAND AND WIFE-- BOTH LAWYERS. THE MOST AMAZING THINGS ARE STORED THERE-- INCLUDING COMPLETE BUTTON MAKING EQUIPMENT-- AND I THINK PARADE STUFF..
it is our dogs at the conference table at dartworld.. THEY LEFT METHUEN AT 9:15PM LAST NIGHT. I JUST SPOKE TO HIM AND HE IS IN WILKES BARRE, PA. HE SAID CHAOS IS BEING VERY GOOD. HE DROVE THROUGH THE NIGHT AND WAS STARTING TO GET TIRED. SO, HE SAID HE IS GOING TO CLIMB IN THE BACK SEAT WITH CHAOS AND TAKE A COUPLE OF HOUR NAP. SO FAR, IT HAS BEEN AN UNEVENTFUL TRIP. I DON'T KNOW HOW MICHELLE IS DOING... SHE IS STILL IN THE LOCK DOWN STAGE OF BONDING.-- I DID SEE SMOKE OUT OF THE STOVEPIPE AND HER PRTNER RRIVED WITH FOOD-- SO I KNOW SHE IS ALIVE IN THE TRAINING ROOM. AND THEN THERE IS THE HILL BY THE DEAGLE HOUSE... MY CONCEPT IS TO PUT BIG BOULDERS AROUND THE BOTTOM AND BANK UP THE REST WITH NOT QUITE SO BIG FIELDSTONES THEN MYBE THROW STONE DUST OVER IT ALL TO PACK IT IN. GOT TO DO SOMETHING.. BUT MY METHOD GOT QUESTIONED. SHE DID SOLVE THE DRAINAGE PROBLEM IN THE BARN-- WITH A MASSIVE SNAKE THING.... IT WAS PLUGGED WITH PLASTIC BAGS, DOG HAIR , DUCT TAPE AND SOME STEEL WOOL?????? HOPEFULLY WE DO NOT HAVE TO DIG THAT UP NOW..
SHELIA CRANEY-- AKA CRANEY HOME SERVICES - DANVERS HAS A TREMENDOUS COLLECTION OF REPAIR TYPE PEOPLE AND STUFF WE HAVE BEEN SORELY IN NEED OF FOR YEARS. THEY COME.. THEY FIX.. MINIMUM OF FUSS. I DID A CHAPTER OF THE BOOK OVERNIGHT--- I DISCOVERED A CENTRAL THEME " WHEN YOU HAVE TOO MANY LEMONS YOU MAKE LEMONAID"
FROM TOO MANY NEIGHBORHOOD KIDS PUTTING TOGETHER A CIRCUS ---- TO TOO MANY DONKEYS PUTTING TOGETHER A HITCH LIKE THE BUDWEISERS, ----TO TOO MANY DANES PUTTING TOGETHER AS SERVICE DOGS. ADAM WAS OVERNIGHT- AND HAS NOW GONE TO BED. THERE EXISTS A CHART OF THE POSSIBLE OUTCOMES OF VARIOUS BREEDINGS-- AND COMPARING OUR FAMILY TREE TO THESE NUMBERS, IS VAGUELY SIMILAR. GREAT DANE CLUB OF AMERICA HAS A GREAT DEAL TO SAY ABOUT COLOR ETHICS. I THINK AKC STILL APPROVE OF BREEDING HARL TO HARL WHICH CAN ALSO PRODUCE DEAF BUT THE H TO H CAN POSSIBLY PRODUCE A "SHOW DOG )"-- MERLE TO MERLE CANNOT. 25% BLACK 50% MERLE 25% WHITE.. WITH SOME DEAF. AND NO "SHOW DOGS"
WHICH COULD PRODUCE MORE PIEBALDS ...LIKE WHO CARES? AKC DOES..?? THE SHOW PEOPLE WILL HAVE ALOT TO SAY I AM SURE..
GRANTED IT MAY I NDICATE A DIFFERENT GENETIC MAKE UP.. AND... GIVEN A CHOICE I WOULD NOT CHOOSE THEM FOR BREEDING. I HAVE BEEN IN TROUBLE WITH AKC SHOW PEOPLE EVER SINCE I PURCHASED THE 100 BLUE RIBBONS FOR 15 CENTS EACH AND HUNG THEM ON MY WALL. WELL THOSE ARE A FEW OF THE DETAILS. ON TOP OF ALL THAT... I WANTED TO TRY AND MAKE A SEEING EYE DOG OUT OF YELOW-- BEFORE I REALIZED I BETTER KEEP HIM AN ENTIRE MALE JUST IN CASE-- SO I GAVE HIM TO DENISE... SOMEONE LOCAL. AND TO FURTHER REPORT ON THAT LITTER.. MAGNUS A COUPLE WEEKS AGO WENT TO BATTLE WITH ONE OF MEGAN'S MOTHER'S DOGS AND SLIT AN EAR- MUCH LIKE LUNA'S -- IT HAPPENS-- SO HER MOTHER DECIDED INSTEAD OF TRYING TO STITCH IT UP LEAVING HIS EARS UNMATCHED, JUST HAD BOTH CROPPED SO THEY WOULD MATCH.. I WOULD LIKE TO FOOL WITH MORIAH'S TRAINING.. BUT NOT SURE I HAVE THE TIME OR ENERGY.. SO SHE MAY HANG AROUND FOR A WHILE AND SEE WHAT FATE HAS IN MIND FOR HER..
WE HAVE ENOUGH OF SERVICE DOGS TO WORK WITH AT THE MOMENT.. . LIKE 12 THAT HAVE NOT BEEN "STARTED--- DOIN' THE ONE STEP CRAWL" IN THE MALLS. MANY DOGS MOVING AROUND- I HAVE TO KEEP A CHEAT SHEET IN MY POCKET.. I GUESS I AM TOO OLD TO THINK IT IS FUN TO HAVE A TRIP INTERUPTED BY AN OVERTURNED TRAILERLOAD OF FISH. ........BUT I AM NOT TOO OLD TO WISH FOR AN OVERTURNED TRAILER OF DOG FOOD... I'D BE RIGHT IN THERE GRABBING THAT. THE REST OF THE DOGS ON THE MOVE.... --- FROM MY LIST--- FURNATURE PERSON FROM NH WILL BE HERE FOR A FEW DAYS INTHE GUEST HOUSE FOR SOME LESSONS WITH HER NEW DOG-- AND MICHELLE #14 ( WE HAVE ALOT OF MICHELLE'S) WILL CAMP OUT IN THE TRAINING ROOM.... WITH HER NEW PARTNER.. SPEAKING OF DAVID-- HE AND HIS FAMILY ARE DOING WONDERFULLY WITH DUSTIN.- FURTHERMORE HE IS COMING BACK ON WEDNESDAY TO HELP-- THE CHORE I HAVE GIVEN HIM IS A HUGE ONE.. ALL OUR JERRY RIGGED GATES COULD BE GREATLY IMPROVED BY THE CORRECT HARDWARE.. IN OUR .... SHALL I SAY--GROWTH-- STAGE, I HUNG GATES-- OR WHAT WAS NEARLY A GATE ON A VARIETY OF CONTRAPTIONS INCLUDING LEATHER FOR HINGES-- SO ..... HE WENT AROUND PHOTOGRAPHING THE MISERABLE COLLECTION AND SAID HE WOULD BE BACK WEDNESDAY TO REMEDY THEM-- OR AT LEAST A FEW OF THEM. GREG SHOWED UP ON HIS HARLEY-- A TYPICALLY SHINED UP BUNCH OF HARDWARE I GET A KICK OUT OF MOTORCYCLISTS- AT LEAST 94% OF THEM-- BUY A NEW BIKE- AND IMMEDIATELY START TAKING IT APART AND ADDING PIECES..
THAT MEANS TODAY I MUST PUT UP THE TIGHT STRING TO ALLIGN THE POSTS..
THEN THERE IS A COMPANY IN NH.... WHO INSISTS THEIR EMPLOYEES DO A DAY OF VOLUNTEERING-- SO I WILL BE READY FOR THEM TO TAKE DOWN THE OLD FENCE AND PUT UP THE NEW. THEY WILL BE HERE ?? ?THE 19TH?? I DON'T THINK THE PUPPY HILL CAMERA CAN FOCUS THAT FAR-- BUT IT WOULD BE A GOOD AREA TO USE. SPEAKING OF CAMERAS-- THERE ARE NEW CAMERA PEOPLE TODAY SO GET READY TO HELP THEM LEARN WHAT YOU ALL WANT... THEY MAY BE VOLUNTEERS... I CAN'T REMEMBER.. I AM ABOUT TO DO IT AGAIN- I THINK I OWN EVERY PIECE OF EQUIPMENT THAT SAID IT COULD ORGANIZE MY OFFICE- I SHOULD HAVE THEM UP ON FALSE ADVERTISING. 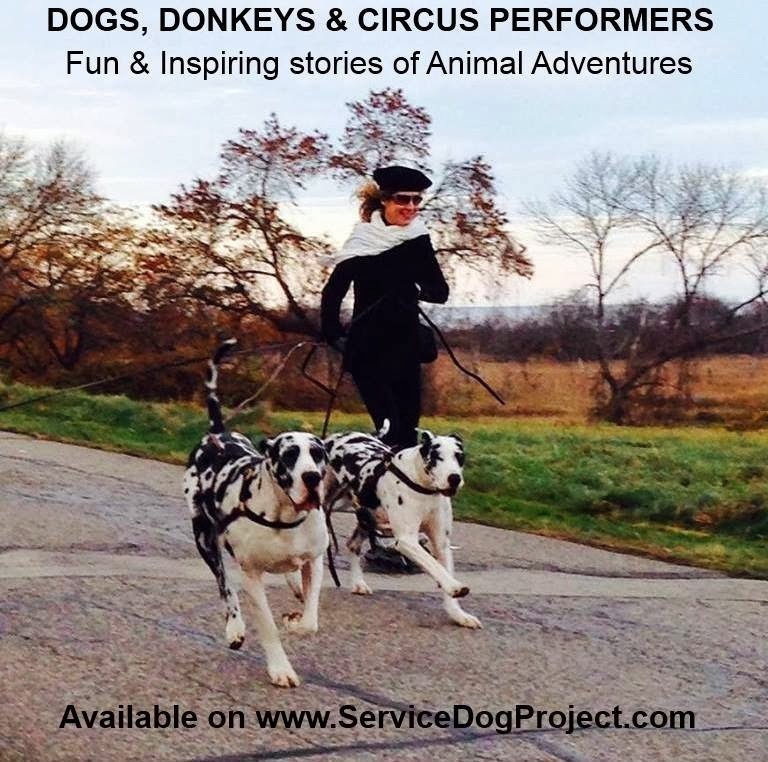 SO... OFF WE GO AGAIN... JANINE HAS A BUNCH OF PAGES WRITTEN FOR THIS BOOK-- 2 PEOPLE HAVE READ HER PART AND SAID IT IS INTERESTING/FUNNY NOW I AM EXPECTED TO COME UP WITH THE "STORY" OF SERV DOG PROJECT. THE BOOK " VOICE RECORDING FOR DUMMIES." WORSE THAN THAT .... I NEED " BOOK WRITING FOR DUMMIES". JANINE'S DESCRIPTION OF BEING THE "GOFER" FOR ANIMALEPISODES IS FUNNY... NOW... LIKE THE JOB I BOOKED FOR HER TO GALLOP A RACE HORSE ACROSS A FIELD... SOUNDED SIMPLE.. TIL WE GOT THERE AND FOUND SHE WAS TO WEAR A CHICKE N SUIT--- WHICH WASN'T BAD TIL I BOOSTED HER UP ON THIS RACE HORSE AND THE CHICKEN SUIT WENT UP AS SHE STRADDLED THE HORSE MEANING THE HEAD WENT UP AND SHE COULD NOT SEE THRU THE NECK-- WHICH TOOK HORSE GALLOPING TO A WHOLE NEW LEVEL AS SHE TRIED TO MANAGE THE REINS WITH THE FEATHER COVERED HANDS..
"THERE IS A BIRD IN THE KENNEL"
OLD HAT TO THE CP'S NOW.. BUT 6 MONTHS AGO IT WAS CAUSE FOR ALARM..
AND I WAS REMINDED OF " THE REASON SHE HAD A STILLBORN PUP IS YOU WERE USING CELL PHONES IN THE ROOM" TO WHICH AN EXPLORE TECH REPLIED " THE REASON FOR THE STILBORN WAS THAT YOU DID NOT WASH YOUR PHONE FIRST." THE EQUALLY BIZZARRE CONCEPT IS THAT THE PURCHASE OF A VOICE TO PRINT RECORDER WILL SAVE ME. TUESDAY AT 4PM DID NOT MEAN 4:02PM. ACTUALLY A VERY VALUABLE LESSON- IT SEEMS NOW THAT THERE MUST HAVE BEEN A MORE EFFICIENT WAY TO EDUCATE ME ABOUT DEADLINES. THE LACK OF THIS KNOWLEDGE IN THE GENERAL POPULATION IS ALARMING.. I DID NOT GO TO THE WANT AD ( MAGAZINE) OFFICE VERY OFTEN EVEN THO I WAS RESPONSIBLE FOR ALL THEIR COMPUTER ACCOUNTING. IT WAS SHOCKING---- PEOPLE WERE SUPPOSED TO START AT 9:00 AND THEY WOULD WANDER IN AT 9:17 WITH A TAKE OUT BREAKFAST IN THEIR HAND... EXPLAINING THAT THERE WAS A LONGER THAN USUAL LINE AT THE TAKE OUT. EATING BEFORE 9:00 WAS FOREIGN TO THEM-- AS WAS ALLOWING FOR A FEW MINUTES TRAFFIC PROBLEM- WHICH HAPPENED EVERY DAY. IT WASN'T COLLEGE THAT TAUGHT ME IF YOU LIKE THE JOB YOU WILL BE A FEW MINUTES EARLY. I LEARNED THAT FROM THE DIRECTOR OF THE YWCA WHO FIRED ME FOR BEING 5 MINUTES LATE TOO OFTEN. I CAN HEAR HER STILL "YOU ARE NEVER 5 MINUTES EARLY-- YOU ARE FIRED." ONE MINUTE LATE FOR AN AIRPLANE DOESN'T WORK EITHER. EBONY AND AL ARE DOING GREAT-- THEY WILL PROBABLY BE LEAVING HERE BOUT 1:00 TODAY-- SO IF YOU WANT TO MEET THEM GET EHRE BY THEN. IT IS A LITTLE DIFFERENT THAN THE USUAL SERVICE DOG-- EBONY IS YOUNGER THAN WE USUALLY PUT OUT... BUT THEY HAVE HAD MANY ANIMALS BEFORE AND ALL EBONY NEEDS IS 20 MILES OF "DOIN' THE ONE STEP" WHICH AL CAN DO WITH EBONY AND HIS WIFE.. AND IN TH E MEANTIME EBONY WILL HAVE HIS COMPANY INSTEAD OF KENNEL LIVING. A BIT OF AN EXPERIMENT-- SHE IS YOUNG AND "IN TRAINING" THEY CAN SOME BACK IN A FEW MONTHS WHEN SHE IS READY TO BE DEEMED A SERV DOG. IN THE MEANTIME A SERV DOG IN TRAINING HAS THE SAME PUBLIC ACCESS RIGHTS AND RESPONSIBILITIES..
YOU GIVE THEM A HAPPY LIFE AND WHEN IT IS OVER YOU LET THEM GO TO SLEEP . WHEN YOU DRIVE- YOU SHOULD PUT A GLASS OF WATER ON THE DASHBOARD- AND IF YOU SPILL IT TOO OFTEN, EVENTULLY YOUR DOG WILL NOT GET IN THE CAR AT ALL.----- PANIC STOPS-- JACK RABBIT STARTS ARE NOT A HAPPY EXPERIENCE FOR CANINE PASSENGERS.